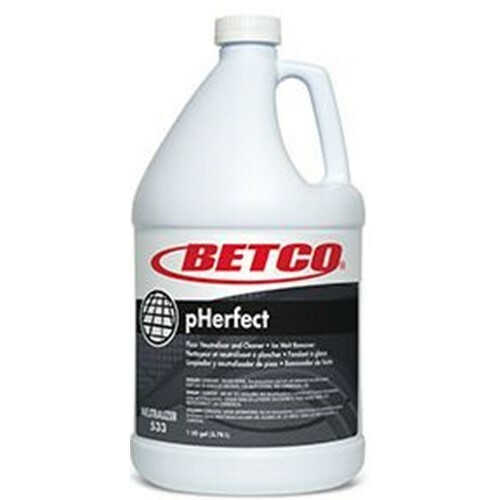 Betco, pHerfect, Floor Neutralizer and Cleaner/Ice Melt Remover, 5330400, 4 Gallons per case, sold as one gallon. Home → Chemicals → Betco, pHerfect, Floor Neutralizer and Cleaner/Ice Melt Remover, 5330400, 4 Gallons per case, sold as one gallon. Formulated with neutralizing agents and surfactants to both penetrate and clean tough soils and neutralize common ice melt ingredients, such as sodium and magnesium chloride. Ideal for conditioning floors after stripping and before coating. No need for a two step process, neutralize and clean in one simple step. This amazing product leaves practically no residue. Features: Dual performance - penetrates and neutralizes in one step. Excellent floor conditioner after strip outs. Leaves virtually no residue on the floor. Dilution: DAILY CLEANING: Dilute 2 ounces per gallon of water (1:64) and damp mop floor surface. FLOOR NEUTRALIZER: To remove residue from salt or calcium chloride on finished floors ??? dilute 5 oz. per gallon (1:25) of water. Mop or scrub floor and then follow with a clean water rinse. NEUTRALIZE AFTER STRIPPING: Dilute 3 oz. / gallon (1:40) of water. Mop or scrub floor and then follow with a clean water rinse. Please recycle empty container.